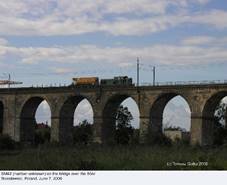 Something slightly ‘different’ to begin with: SM42 (number unknown) on the longest stone railway bridge in Poland; Bolesławiec, June 7, 2006. 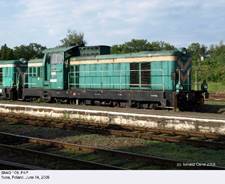 Slightly derelict SM42-002, photographed at the Ełk depot on June 15,2006. Another picture taken in Ełk on the same day: SM42-016. 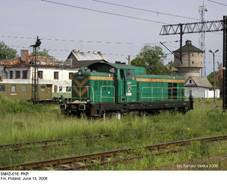 SM42-144 leaves the Szczytno station with a passenger train on July 26, 2002. 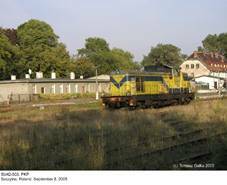 Another picture from Szczytno: SU42-503, photographed on September 8, 2005. SM42 side view; drawing by M.Ćwikła from SK vol. 5/2002. ‘New’ SU42 side view; drawing by M.Ćwikła from SK vol. 10/2001. 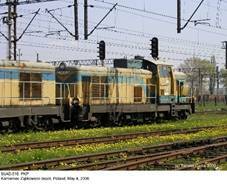 In early 2004, over 80 SM42s were based in Warsaw (where I live). Some can be seen here. 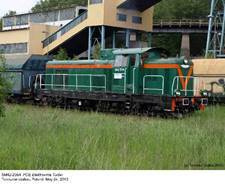 A number of SM42s remain in use with ArcelorMittal Warszawa steelworks – check here. 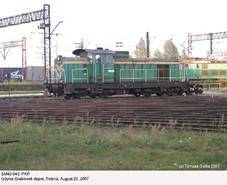 This Ls800-2667, photographed at the Turoszów station on August 21, 2002, is used by the Turów power plant (cooling towers in the background). 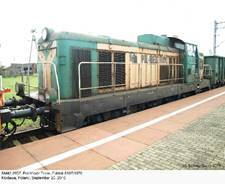 Another picture of this locomotive (but re-designated SM42-2667), taken at the same location on December 21, 2010. 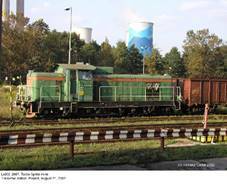 Another example from a power plant, this time SM42-2196 from Ostrołęka; October 14, 2005. SM42-831, Pilawa, February 2, 2003. 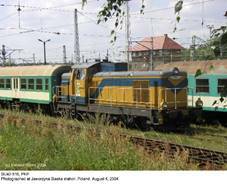 SM42-765 at the Zawidów station, August 22, 2002. 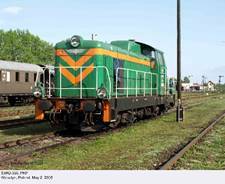 SM42-1122, Mława, May 10, 2003. 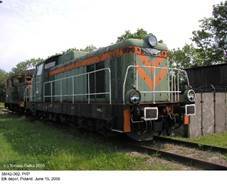 This SM42-893, photographed at the Chabówka loco heritage park, is not a heritage loco! Photo taken on April 13, 2004. 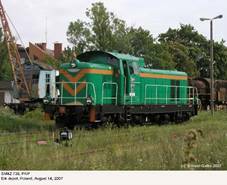 During the 2006 steam locomotive show at the Chabówka depot, SM42-664 provided necessary assistance; July 29, 2006. 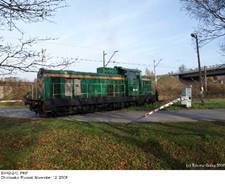 Another SM42 on duty in Chabówka: SM42-270, photographed on November 12, 2008. 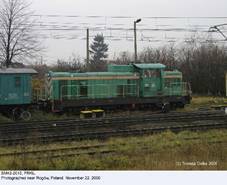 SM42-2015, used by PRKiL track maintenance company; Rogów, November 22, 2006. 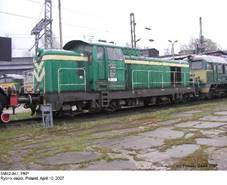 SM42-1109, Iłowo, October 24, 2004. 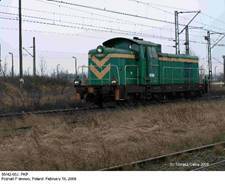 SM42-950, Milówka, March 2, 2005. 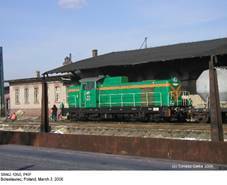 SP42-175, Kościerzyna, February 5, 2003. SU42-514, Puck, August 6, 2003. SU42-524, Hel, August 16, 2003. 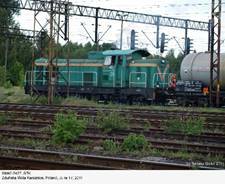 ...and SU42-514 alone were photographed at the Hel station on August 23, 2007. 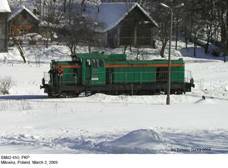 ...and SM42-862, the same location, January 30, 2008. 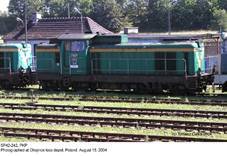 Krotoszyn once again: SM42-861, August 13, 2008. SM42-1050, Bolesławiec, March 3, 2006. 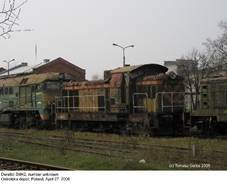 Derelict SM42 (number unknown), photographed at the Ostrołęka depot on April 27, 2006. 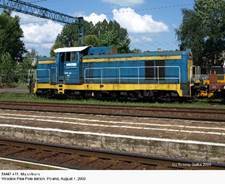 SP42-242, Chojnice, August 15, 2004. 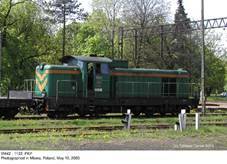 SM42-336, photographed in Wolsztyn during the Steam Locomotive Gala on April 29, 2006. SM42-336 performed the same duties during the 2008 show; photo taken on May 2. During the 2007 parade on April 28, SM42-650 was used for switching. 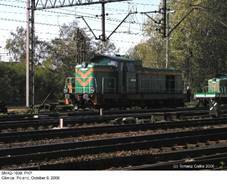 …and yet another: SM42-774, October 28, 2008. SU42-530, Kudowa Zdrój, May 3, 2005. 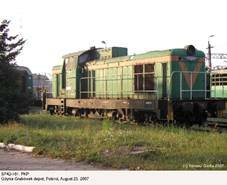 SM42-1077, Kraków Płaszów, September 9, 2006. 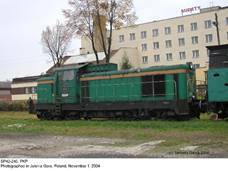 SP42-245, photographed at the Jelenia Góra depot on November 1, 2004. 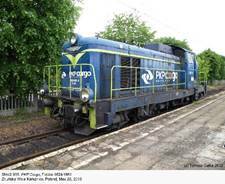 …and SM42-499, displaying new PKP Przewozy Regionalne livery. 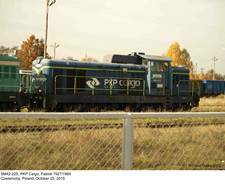 New PKP Przewozy Regionalne livery is also demonstrated by this SM42-304, photographed in Tarnowskie Góry on September 1, 2008. Photo by Ryszard Rusak (thanks for permission!). 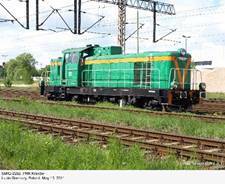 SM42-2149 from the Pol-Miedź Trans fleet, Lubin Górniczy, June 9, 2006. 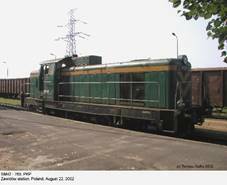 Derelict SU42-128, Legnica depot, June 9, 2006. Lack of the fairing aft of the driver’s cab is clearly visible. 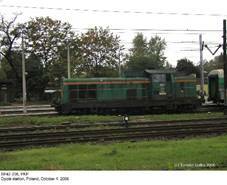 SP42-208, Opole, October 4, 2006. 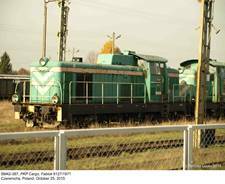 SM42-1038, Gliwice, October 6, 2006. 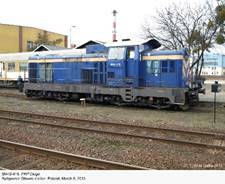 SM42-847, photographed at the Rybnik depot on April 10, 2007. 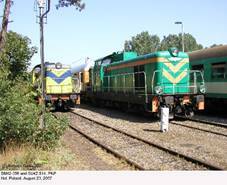 SM42-735, Ełk depot, August 14, 2007. ...and SP42-161, the latter probably withdrawn. 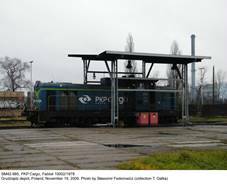 One of very few photographs of the EPA42-001, taken at the Warszawa Odolany depot, probably in 1996. Photo by Maciej Stępień (thanks for permission!). 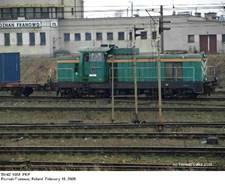 Another picture of the sole EPA42-001: Warszawa Odolany depot, January 24, 1998. Photo by Bartosz Łoziński (from my collection). More pictures of SM42s, SP42s and SU42s from my collection can be found here. 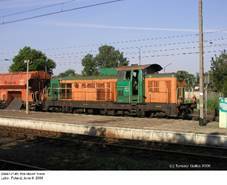 SM42-2251 from the Maczki Bór sand mine, photographed in Czempiń on May 2, 2008. 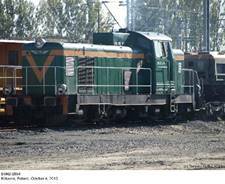 This engine belongs to the Konin lignite mine; note dual designation (Ls800/SM42-1657). 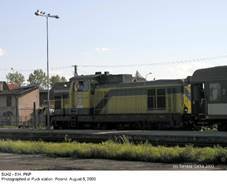 Photo taken at the Kleczew depot on September 16, 2008. 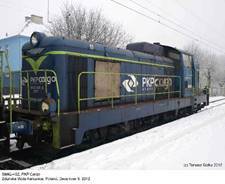 SM42-2130 from the PCC Rail fleet, photographed at the Sosnowiec Jęzor depot on November 27, 2009. 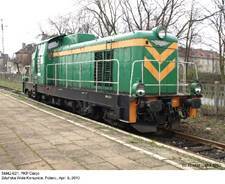 SM42-1026, Racibórz station, April 27, 2009. SM42-073, Wrocław Sołtysowice, June 3, 2009. Back in Wrocław: SM42-411 from Majkoltrans company, photographed at the Psie Pole station on August 7, 2009. 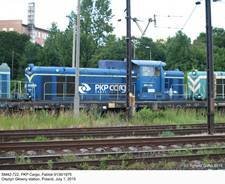 …and SU42-526, the latter displaying new PKP Przewozy Regionalne livery. 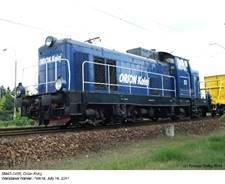 Chabówka again: SM42-750 was the ‘service loco’ during ‘Parowozjada 2009’. Photo taken on September 6, 2009. 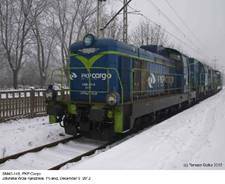 SM42-473, PKP Cargo, approaches the Wrocław Psie Pole station; February 17, 2010. 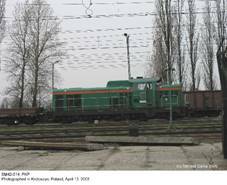 SM42-385, PKP Cargo, photographed with a track maintenance draft at the Warszawa Wawer station on March 4, 2010. SM42-621, photographed in Zduńska Wola Karsznice on April 6, 2010. Another picture from this location: SM42-510, October 6, 2010. 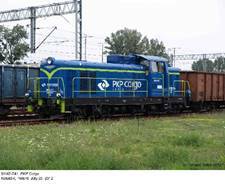 SM42-459, PKP Cargo, Krotoszyn station, May 19, 2010. 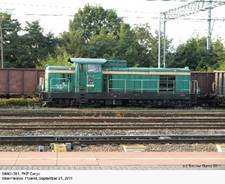 This SM42-592 (Fablok 8631/1973) is used by the PNI track maintenance company; photo taken near the Warszawa Zachodnia station on September 19, 2010. …and SM42-2577 (Fablok 10335/1983). Both pictures taken during our visit with Chris West on September 20, 2010. Many thanks to everyone involved for the ride! 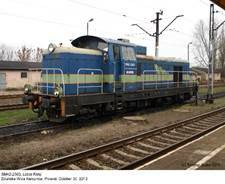 …and SM42-2190 from the Lotos Kolej fleet, but still in old PKP-type livery. More pictures of SM42s from this company can be found here. 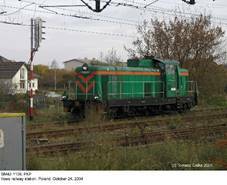 Another Pol-Miedź Trans locomotive: SM42-2162, photographed in Bolesławiec on October 6, 2010. 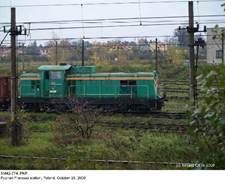 …and SU42-504 (ex SP42-055, Fablok 8757/1973), Polanica Zdrój, October 19, 2008. 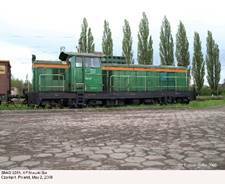 SU42s have already been replaced with railcars in this region. 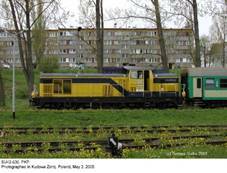 This SM42-2292 is owned by PRK Kraków track maintenance company; photo taken at the Lubin Górniczy station on May 13, 2011. 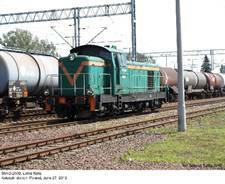 Zduńska Wola Karsznice again: STK-owned SM42-2427 with a draft of tank cars. June 17, 2011. 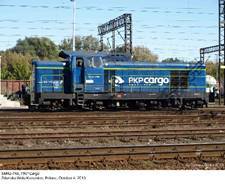 SM42-381, PKP Cargo, Skierniewice, September 21, 2011. 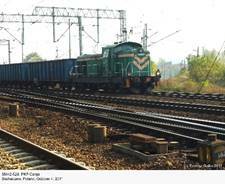 SM42-528, PKP Cargo, maneuvering at the Sochaczew station; October 4, 2011. 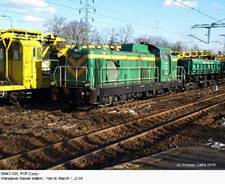 This SM42-1153 is operated by PNI track maintenance company; Tomaszów Mazowiecki, October 19, 2011. 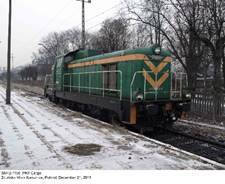 This storage track used to be occupied by ET42s: SM42-1156, photographed in Zduńska Wola Karsznice on December 21, 2011. Another visit to the same location: a SM42-2467, operated by Hagans Logistics and advertising the Cargomaster software package. February 29, 2012. 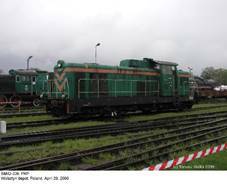 …and SM42-2249, both photographed at the Sosnowiec Jęzor depot on April 10, 2012. 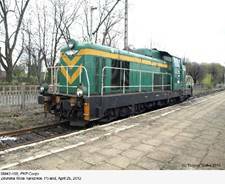 This SM42-204 is operated by Przewozy Regionalne; photo taken at the Skarżysko Kamienna station on April 14, 2012. 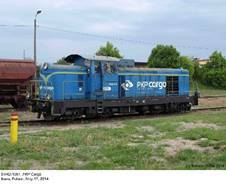 …and SM42-1112, photographed on the same day; all are operated by PKP Cargo. 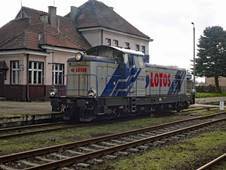 SM42-2600, Lotos Kolej, Koluszki station, June 27, 2012. 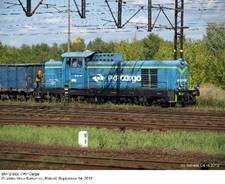 Another picture from this location: SM42-741, PKP Cargo, July 25, 2012. Ls800-9364, Orion Kolej, photographed in Rokiciny on September 12, 2012. SM42-2167 from the same operator, photographed a few hours later in Długołęka. 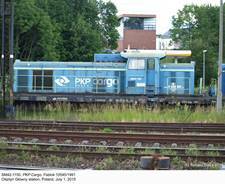 Another private operator: SM42-2500, SKPL, photographed at the same location two days later. …and SM42-911, photographed on March 1, 2013. SM42-419, Bydgoszcz Główna station, March 9, 2013. 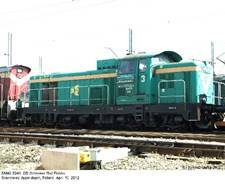 This SM42-2384 is operated by PGE Elektrownia Turów power plant and was photographed at the Turoszów station on May 24, 2013. 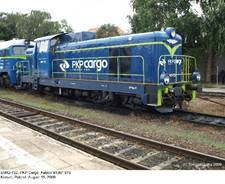 SM42-935, PKP Cargo, was photographed in Zduńska Wola Karsznice on the next day. SM42-093, photographed exactly at the same location on June 7, 2013. SM42-451, Koluszki, August 19, 2013. 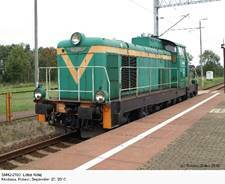 SM42-816, photographed at the Radom station on September 30, 2013. SM42-2167 operated by Orion Kolej. 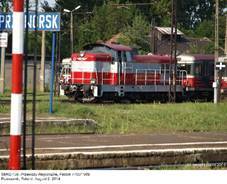 Photo taken at the Kościerzyna station on September 23, 2013. SM42-2334, photographed on the same occasion. 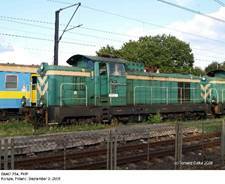 SM42-746, Zduńska Wola Karsznice, October 4, 2013. The same location: SM42-2563, October 30, 2013. 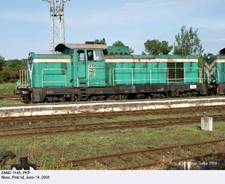 SM42-2564, probably owned by PHU Lokomotiv and leased to a track maintenance company. Koluszki station, October 4, 2013. SM42-2636, CTL Chemkol, Kędzierzyn-Koźle, March 28, 2014. SM42-2640: the same operator, location and date. 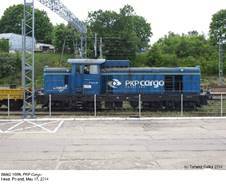 SM42-1081 from the PKP Cargo fleet; Iława, May 17, 2014. SM42-1059, photographed on the same occasion. A photo (unfortunately not a particularly good one) of the Ls1000-001, operated by PTKiGK Rybnik. Location and date unknown. Photo from my collection. 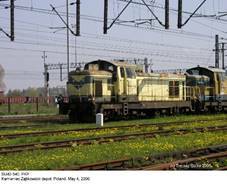 Ls1000-002 from the same operator: May 11, 2004, location unknown. Photo by Rafał Roskosz (from my collection). 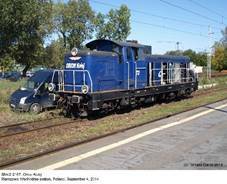 SM42-2455, Orion Kolej (previously operated by Lotos Kolej) with a draft of track maintenance vehicles; Warszawa Wawer, July 16, 2014. 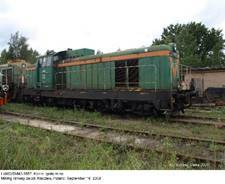 SM42-156 from the Przewozy Regionalne fleet, photographed in Przeworsk on August 2, 2014. 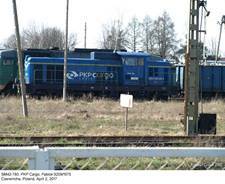 SM42-431, PKP Cargo, Zduńska Wola Karsznice, April 21, 2014. 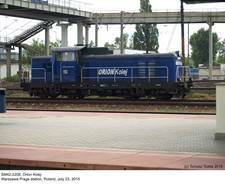 SM42-2167, Orion Kolej, Warszawa Zachodnia station, September 4, 2014. 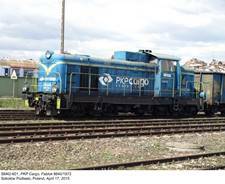 SM42-601, PKP Cargo, photographed in Sokołów Podlaski on April 17, 2015. SM42-2208, Orion Kolej (bought from Lotos Kolej), Warszawa Praga station, July 23, 2015. 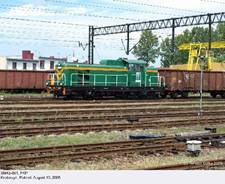 SM42-1075, PKP Cargo (Fablok 10409/1986), photographed in Ostrołęka on August 2, 2015. …and SM42-034. 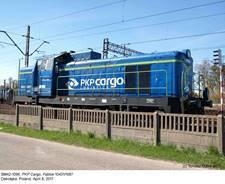 All are from the PKP Cargo fleet. 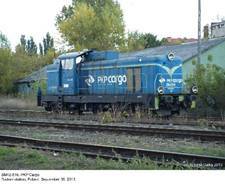 SM42-985, PKP Cargo, Grudziądz depot, November 19, 2009. Photo by Sławomir Fedorowicz (from my collection). SP42-267, photographed in Nysa on June 8, 1995. Photo by Marek Niemiec (from my collection). 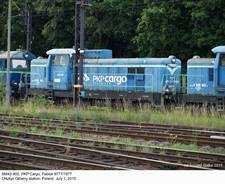 SM42-434, PKP Cargo (Fablok 8268/1971), possibly withdrawn; Czeremcha depot, July 31, 2016. 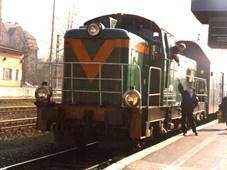 SP42-267, photographed at the Opole Główne station on March 26, 1998. Photo by Mariusz Plewka (used by permission). 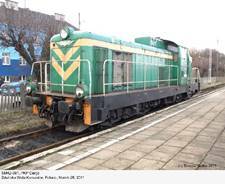 SM42-935 (Fablok 9824/1977), Sokołów Podlaski, March 31, 2017. 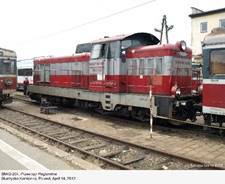 SM42-780, photographed at the Czeremcha depot on April 2, 2017. SM42-1096, Ostrołęka, six days later. 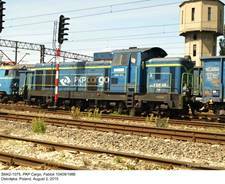 SM42-996, PKP InterCity, Lublin station, July 29, 2017. 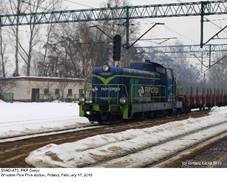 SU42-509 (rebuilt SP42-139), Przewozy Regionalne, the same location and date. 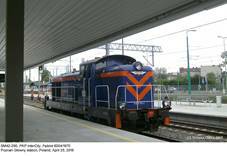 SM42-290 is used as a switcher by PKP InterCity; photo taken at the Poznań Główny station on April 25, 2018. 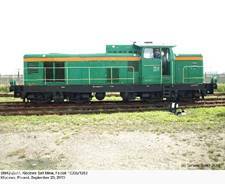 SM42 medium switcher was developed with an intention to replace a motley collection of obsolete and worn-out steam engines used for switching and with light local freight trains. 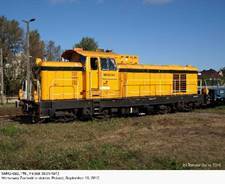 Such locomotive was necessary for both PKP and industrial operators, for whom 300 hp SM30 was too weak. 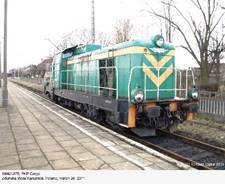 Design was submitted by the CBK PTK (Central Design Bureau of the Railway Stock Industry) of Poznań in 1962 and production was entrusted to Fablok of Chrzanów. 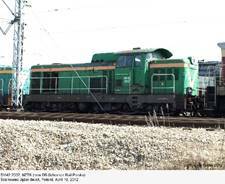 New machine was fitted with the indigenous a8C22 medium-speed turbocharged eight-cylinder diesel, developed by HCP; up-rated version of this prime mover was later successfully used in the SM31 heavy switcher, but its 12-cylinder variant, intended for the SP45 passenger locomotive, proved a failure and was finally abandoned. Alternative and more advanced high-rpm CD19 diesel engine, although built as a prototype and successfully tested, was not proceeded with. 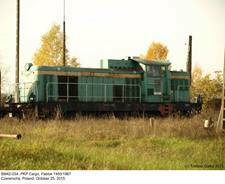 Almost in parallel, attempts to produce a medium switcher with hydraulic transmission were pursued, on the basis of Soviet TGM3, which was license-built at Fablok as type 12D or Ls750H with imported diesel engines and torque converters (PKP class SM15). 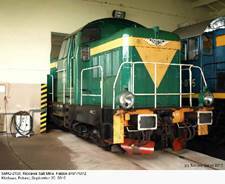 This locomotive, however, proved very unreliable and only 57 examples were built. Their service life was extremely short and SM42 was left on the field. New machine (factory designation 6D) owed something to earlier SM30, as well as to SM40/SM41 supplied by Hungarian Ganz-MAVAG, and certainly drew on service experience acquired with them, but was an entirely new design. 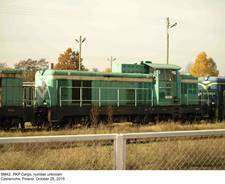 Prototype (s/n 6276/1964) was rolled out in June 1964 and underwent extensive tests, so it was not accepted by PKP before 1967 and actually was preceded in service by SM42-002 and SM42-003, delivered in March 1965. If not particularly advanced, SM42 proved a sound and successful design. 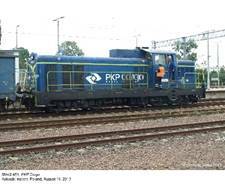 Production for PKP lasted until 1981; it was re-commenced four years later and continued, on a small scale, until 1993. Deliveries for industrial operators went on in parallel. 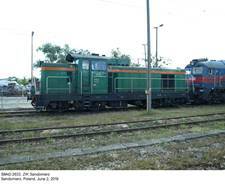 SM42 thus enjoyed the longest production run of any Polish locomotive, comparable only to that of license-built EU07 (and surpassed only by class EN57 EMU). Commonly nicknamed ‘Stonka’ – literally ‘potato beetle’ – it can be encountered virtually everywhere where standard-gauge track has reached. According to some sources, small-scale production for industrial operators continued after 1993. 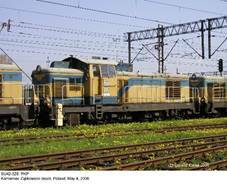 Given such long period, modernizations were rather few, the most important being modified LSf-430 electric engines in place of earlier LSa-430 and improved lighter trucks from SM42-521 onwards. Later variants, built from 1987 onwards, were designated type 6Da and differed mainly in slightly modified suspension. 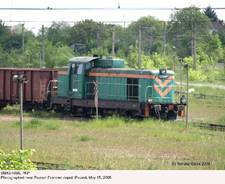 Total output amounted to 1856 examples, of which 1153 went to PKP. 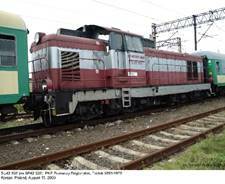 Besides, state railways obtained five more SM42s: three from industry (SM42-1061, -1062 and -1063) and two converted from withdrawn SP42s (service numbers 011 and 012, both assigned for the second time). Thirty-seven (factory type 6D/M) were sold to Morocco in 1973. Classed DG-200 by ONCFM (Office National de Chemins de Fer du Maroc), they differ in minor details – mainly aimed at ‘sand-proofing’ – and are used only as switchers. 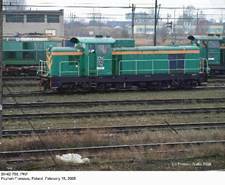 In 1982, six similar engines (factory type 6D/I) were built for Polish construction company Dromex for use in Iraq. 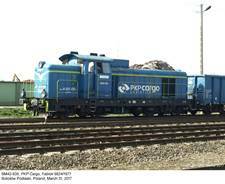 The rest went to various industrial operators; three of them were later sold to PKP and re-numbered SM42-1061 through -1063. 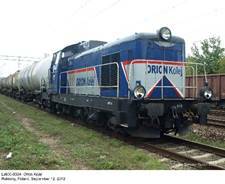 In general, industrial operators designated these locomotives SM42 plus service number (above 2000, to distinguish from those used by PKP) or Ls800. SM42s were also used with local passenger trains, but lack of car heating equipment limited their suitability to warm seasons. In early 1970s an idea of low-voltage (500 V) car heating, with feeding from main generator, was conceived and suitable modifications were introduced in 39 (some sources give 40) SM42s between 1975 and 1977. They were re-classed SU42, but service numbers were retained. As with the SM30/SP30 conversion, this concept did not prove entirely successful. 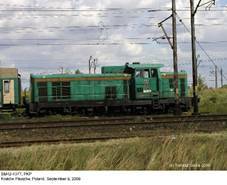 At low speeds, which were typical on local lines for which these locomotives were intended, generator yielded only 200 to 400 V and heating was very inefficient. Moreover, there were few cars fitted with low-voltage heating. 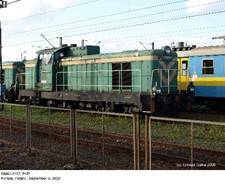 SU42s remained in passenger service until mid-1980s, later to be used as plain switchers; 26 of them survived until 2000, to be re-classed SM42 with heating equipment removed (three were converted back to SM42s earlier and ten were written off between 1997 and 1999). Class designation SU42 was formally cancelled on June 1, 2000. SU42 was in fact preceded in service by a dedicated and more extensively re-designed passenger version. In early 1970, SP42 (factory type 101D) appeared, fitted with WB5 oil-fired heating boiler. Acceptance tests were completed by December. 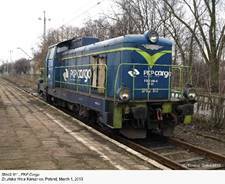 As there were comparatively many steam-heated passenger cars in PKP service, this locomotive found a widespread use and 268 examples were built by Fablok until 1978. SP42 was by some 2.7 tonnes lighter than the original variant; although heating boiler added some extra weight, about three tonnes of cast-iron ballast were removed and new, lighter LN1 bogies were fitted. Externally it is easily distinguished by a streamlined stack fairing aft of the driver’s cab. 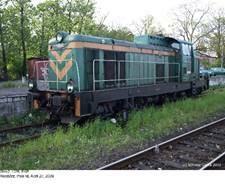 In 1993 two SP42s were converted to the SM42 standard and became SM42-011 and SM42-012, these numbers being allocated for the second time. 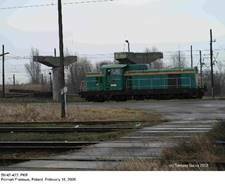 A number of surplus SP42s were withdrawn in late 1990s; on January 1, 1999, PKP had 190 examples, probably not all serviceable. 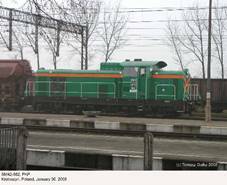 Forty were rebuilt between November 1999 and August 2000; they were fitted with electric heating systems, but this time comprising a 180 kW Caterpillar CAT3208 diesel and 3000V AC generator, which makes them compatible with typical passenger cars used by PKP. These locomotives were re-designated SU42 but, in order to avoid confusion with earlier class, were assigned service numbers from 501 onwards. 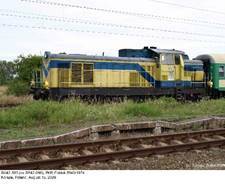 ‘New’ SU42s could initially be distinguished by yellow-blue livery, different from that of other locomotives from this family, which were typically painted green, at least at that time; in 2009 new PKP Przewozy Regionalne livery was introduced. 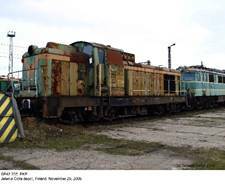 Most unrebuilt SP42s have already been written off or are used as plain switchers with their boilers removed. 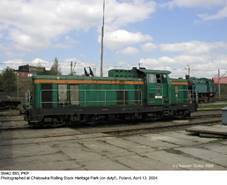 Last examples with steam heating systems were expected to remain in service until circa 2007. 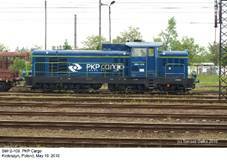 According to KMD, in November 2007 PKP had only three SP42s in normal service (SP42-007, -011 and -172), based at the Skarżysko depot, plus two more (SP42-071 and -247) used as switchers – most probably the latter have retained their heating boilers. 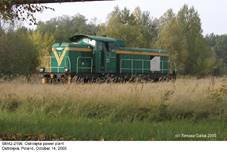 Last scheduled service of a SP42 with the steam heating installation in use took place on September 27, 2008, when SP42-007 hauled a special train for railway fans: steam boiler broke down during the ride. SU42 is not considered entirely satisfactory and, following the appearance of much more economical railcars, many locomotives of this type have been withdrawn from use, although only two were written off after a head-on collission in July 2010. 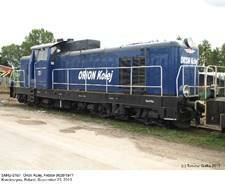 In 2012 only 21 were operational, but many were used only as plain switchers. 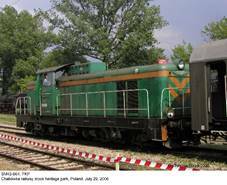 SM42 is still the most numerous diesel locomotive type in Poland. 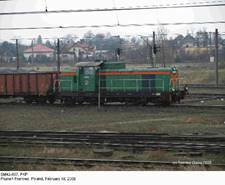 On January 1, 1999, PKP had (according to SK) 1008 SM42s, plus 31 SU42s. 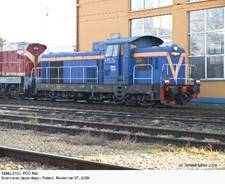 Rosters given in AL list 974 SM42s in the PKP service in early 2004, plus 119 SP42s and 40 SU42s. 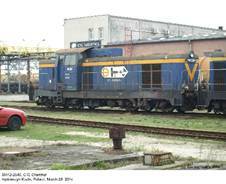 Among private operators, the largest fleets at that time were those of CTL Rail (27), Lotos Kolej (22) and Pol-Miedź Trans (18). Although SM42 has turned out to be a reliable machine, well suited for its intended tasks, it can no longer be judged modern. 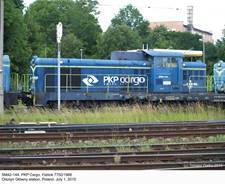 PKP activities concerning modernization of this important and numerous class have for a long time been rather modest. 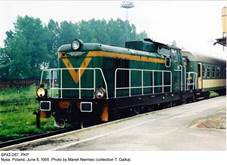 In 1996 one machine (SM42-039, type 6Dc) was fitted with MTU 12V396TC12 diesel engine, rated at 950 hp, ac generator and state-of-the-art controls; there were also numerous minor improvements. 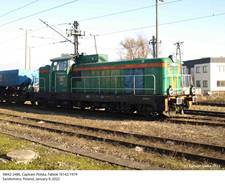 Re-numbered SM42-2000, this successful conversion remained a single example; initially based in Warsaw, it was transferred to Gdynia in 1999 and withdrawn in October 2010. 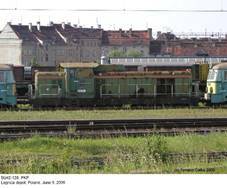 PTKiGK Rybnik, who had a considerable fleet of these engines, implemented a more advanced program, not only involving prime mover (this time 1000hp MTU 8V396TC14), main generator (ac LSG-850-90, supplied by ABB) and minor improvements, but also changing external appearance. New high-rpm diesel engine is much lighter (2.52 tonnes instead of 7.4) and specific fuel consumption is lower by almost 9%. 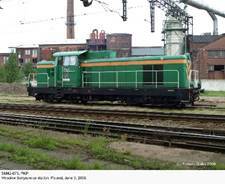 Modernized machine, designated type 6Dd (or Ls1000), has a modified body, with driver’s cab shifted forward and accessible directly from footplates. Modernization of the first example (SM42-2536, s/n 10267/1979, which became Ls1000-01) was completed in March 1999, second one (SM42-2197, s/n 8612/1973) followed three years later. 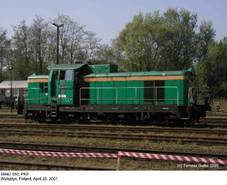 Two examples were modernized by Newag in 2007; fitted with 750 hp Caterpillar C27 diesel engines, they were supplied to a metallurgical plant. 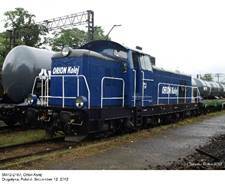 Fablok offered also a special conversion for pig iron transport at foundries. This variant, with factory designation 6Da/R, had provisions for remote control (up to 4 km/h) and could be fitted with additional ‘armor’ of 1.5-mm thick steel plates. As far as I know, only one example has been delivered. Both 6Da and 6Da/R remained in the Fablok offer until the company was declared bankrupt and closed down in May 2013. 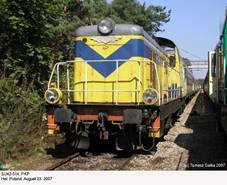 In 2007, Newag presented an extensively redesigned variant, with factory designation type 6Dg, which is in fact a new locomotive and is described under a separate entry. 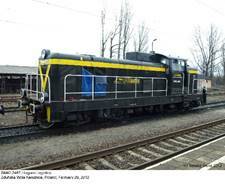 The same refers to type 6Dk (developed by PESA), with two 550 hp Caterpillar C15 diesels, which appeared in 2009. 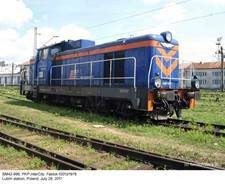 In late 2013 PKP InterCity ordered extensive modernization of twenty SM42s, to be completed by Newag. 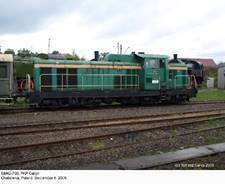 Of these, ten (factory type 18D) were to be fitted with Caterpillar C18 diesel engines, rated at 765 hp, and energy accumulators that allow for short-range ride with the prime mover off. 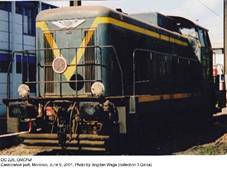 Other ten (factory type 6Dl) were to be fitted with two diesel engines and provision for electric power supply to coaches (they were intended for local passenger traffic). 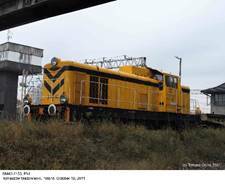 First 18D, designated SM42-3001 and rebuilt from SM42-396, was delivered in June 2014 and the entire contract was completed until November. 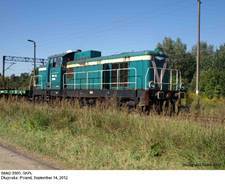 First 6Dk – rebuilt SM42-576 – was outshopped in August 2014 and the last one in May 2015. 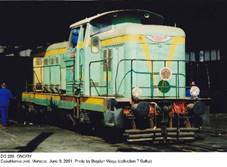 These locomotives were given service numbers SU42-1001 through 1010. Both these conversions are described under separate entries. 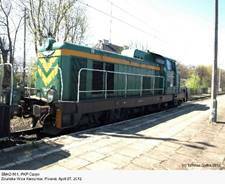 Between 2013 and 2014 at least seven SU42s were purchased and overhauled by Newag. They were given untypical service numbers: SM42-700/17 (previous number unknown), SM42-700/34 (SU42-519), SM42-700/35 (SU42-516), SM42-700/36, SM42-700/37 (previous numbers unknown), SM42-700/38 (SU42-528) and SM42-700/39 (SU42-520). The origin of these designations remains unknown. 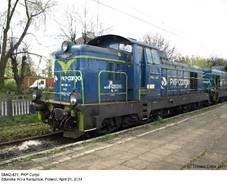 Some of them were temporarily leased to PKP InterCity, but were sporting Newag logos. SM42-700/38 was reportedly sold to a Lithuanian company in 2015. Perhaps the most unusual conversion was EPA42, of which little is known. 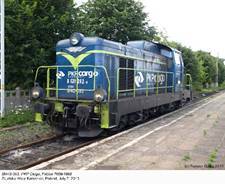 The idea was to obtain a battery-storage locomotive for use with service and rescue trains in areas where exhaust gas emission was unacceptable. 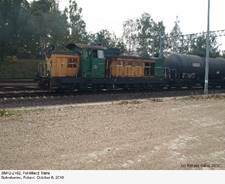 Diesel engine and two of four electric traction engines were removed. Energy was supplied from a battery of 320 cells, with three supply voltage values available, and estimated range was 120 km at 40 km/h. 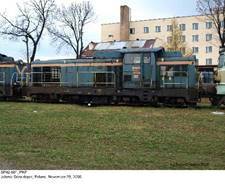 According to initial plans from early 1980s, a number of conversions was to have been made by the railway stock repair works of Nowy Sącz (now Newag), but only one was in fact completed in 1985 (according to some sources, by Fablok). 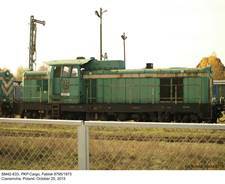 This was the SM42-024, which was re-designated EPA42-001 and assigned to the Warszawa Odolany depot for use with wreck trains in the Diameter Line tunnel, in order to eliminate pollution with exhaust gas. 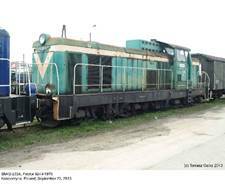 I cannot recall any information on this locomotive ever being used for this purpose. 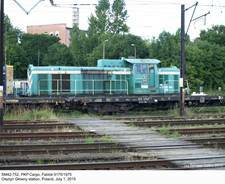 It stayed in Warsaw throughout its entire life and underwent several tests between 1985 and 1987. 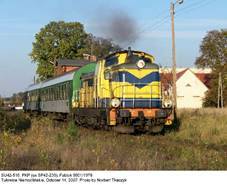 EPA42 proved too weak for the intended purpose (there were problems with hauling even light drafts, comprising five standard four-axle passenger cars) and design maximum speed, estimated at 50 km/h was never attained. 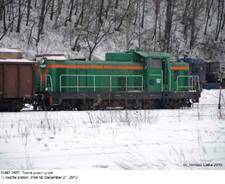 In general this conversion was judged unsuccessful and no further SM42s were rebuilt. 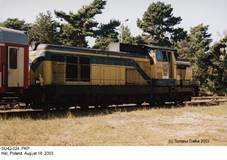 EPA42-001 was written off in October 1996 and scrapped a few years later. 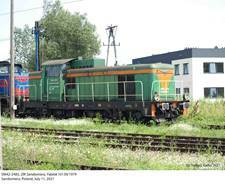 Another ‘electric’ episode in the history of SM42 took place much later, in 2010, when SM42-2243 (formerly owned by Huta Katowice steelworks) was fitted with two current collectors and remote control devices. 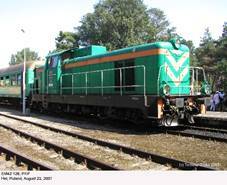 This locomotive is used for works transport and operates on ‘normal’ 3 kV DC. 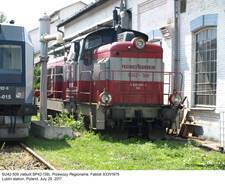 Although SM42 is one of the most popular Polish locomotives, still in use in large numbers, a few have already been preserved. 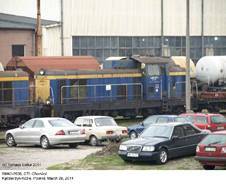 SM42-002 is kept at the Ełk depot, although in a condition far from satisfactory. 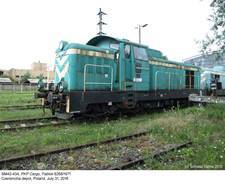 SM42-2339 (Fablok 9247/1976, service designation ‘21’), was plinthed at the Kolprem premises in Dąbrowa Górnicza, although fitted with Diamond-type trucks from freight cars(!). 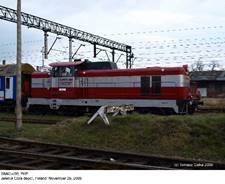 In early 2012 SP42-001 was transferred to the KSK Wrocław railway fan society and is now undergoing external refurbishment. 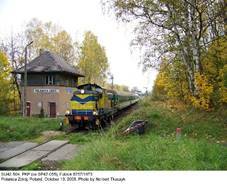 1) Including 1152 for PKP. 3) LSa-430 in earlier examples. 1) Some sources give 69 300 kg. 2) Some sources give 577 kW / 785 KM. 3) Some sources give 269. 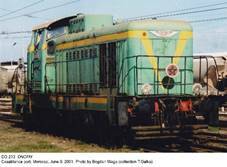 1) Converted from SM42s with service numbers retained; re-classed SM42 in 2000. 2) Converted from SP42s with new service numbers from 501 onwards.